Engineers in Russia’s Southern Military District are expanding their menagerie. This summer, combat engineers from Russia’s Southern Military District, which includes the North Caucasus republics, will be testing out a new way of transporting equipment. They are training yaks to carry explosive detectors in the mountains. Konstantin Smeshko, the head of the engineer troops in the Southern Military District, introduced the program at a July 2 press conference in the district headquarters in Rostov-on-Don. Alexander Lipkovich, deputy director of scientific research at the Rostovsky State Nature Preserve, said that yaks have many advantages in high altitude mountainous terrain over donkeys, which are already used to deliver the equipment to elevated and rocky areas. 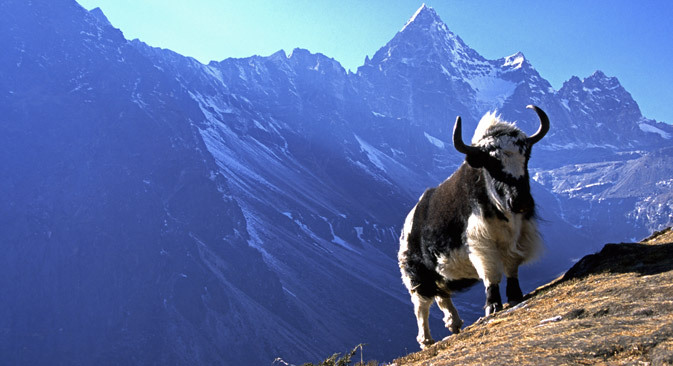 “Yaks are typical mountain animals. The structure of their hooves allows them to travel across uneven surfaces,” Lipkovich said, noting that donkeys are better suited for the lowlands and need to be acclimated to the mountains. Additionally, according to Lipkovich, yaks are capable of transporting heavy loads and are very docile and easy to manage. “Donkeys are known for being stubborn – it isn’t just a literary metaphor,” he said. Smeshko said that several yaks are already undergoing acclimatization in the mountains. It is assumed that they will carry “pretty intense loads” of explosive detectors to altitudes of up to about 8,000 feet. Transport yaks are just the latest example of ways the Russian military is using animals in its work. Combat dolphins are already in the service of the Russian Navy in the Black Sea, which is also part of the Southern Military District. The dolphins can search for items at the bottom of the sea as well as patrol the waters for small submarines and combat swimmers.